- Simultaneous operation of a coin and bill validator as well as 3x hopper. 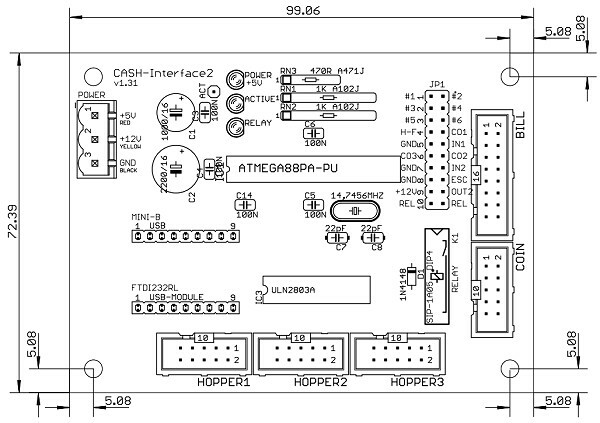 - Works on the USB (with USB to Serial converter) or serial port. 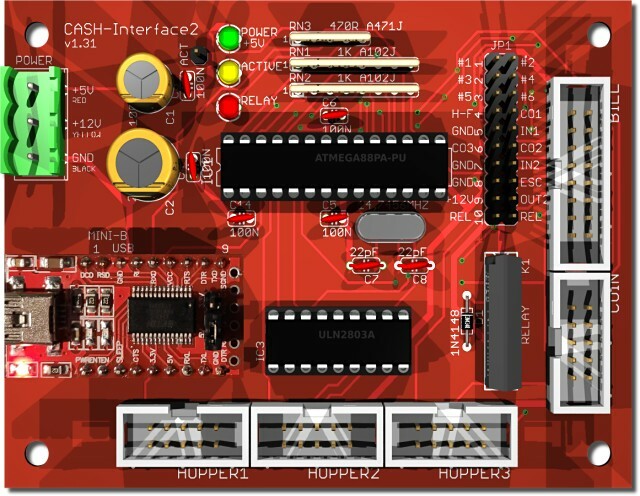 - RS232 plug for direct connection to the mainboard via flat ribbon cable. 15 different bills and 31 different coins possible at the same time. also specially wired connection cables or adapters for all other types, e.g. NRI G40 or GBA HR1. 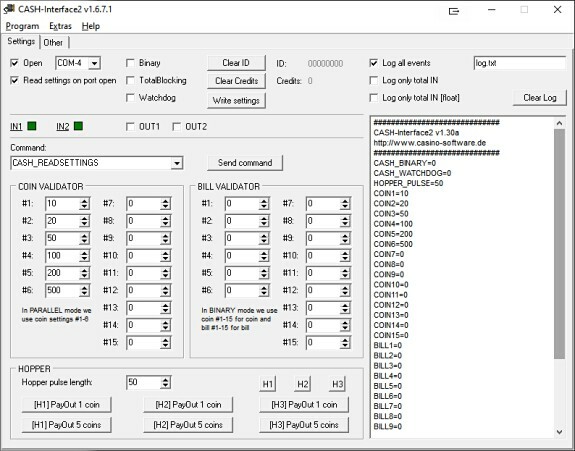 - External coin sorter control via hopper full signal. - Hopper full and empty signal detection. - 2 free useable inputs, e.g. to connect push buttons. - 2 free useable outputs, e.g. to connect lamps or other actuators. 1 output as relay contact. - Watchdog function, that means the acceptance is deactivated on errors. - The control of the devices is done with simple commands. - Coin acceptor sorter control via hopper full signal (SRT / H-FULL jumper). You can also connect every coin and bill validator supporting PARALLEL, PULSE or BINARY mode. Universal Hopper MK2, MK3 and MK4, Evolution Hopper, Escendo Escalator Hopper, Excel Hopper, Compact Hopper SBB, Rode-U-Hopper, Azkoyen hopper, Flow hopper or other that support the PULSE mode. ICT ND-300 , ICT CVD-300 or other that support the HOPPER / PULSE mode. You can also connect every hopper or bill dispenser supporting PARALLEL, PULSE or BINARY mode. Connect the CASH-Interface2 with a serial cable or USB to serial converter to the PC. Supply the interface with a direct current voltage of +5V and 12V. Ensure that the poles are connected correctly! Be sure to take the precaution of making sure the power supply is strong enough. A bill validator can take up to 1500 mA and a coin acceptor up to 500mA of current. A hopper can take up to 3000mA and more! The connection of the coin acceptor (e.g. NRI G13) is made by a 10 pole flat ribbon cable to the plug marked with COIN. The connection of the bill validator (e.g. NV7/8/9/10) is made by a 16 pole flat ribbon cable to the plug marked with BILL. If you want to connect a other bill validator than NV7/8/9/10 you need to assemble a adapter cable with the above occupancy. On request we also supply you with fitting adapter cables. The connection of the bill validator (e.g. NV7/8/9/10) or bill dispenser (e.g. ND-300) is made by a 10 pole flat ribbon cable to the plug marked with HOPPER1, HOPPER2 or HOPPER3. 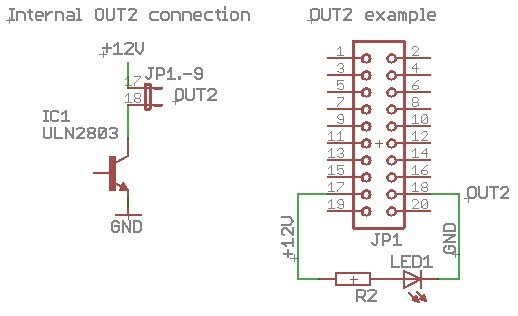 If you want to connect other devices than Azkoyen you need to assemble a adapter cable with the above occupancy or use one of our adapter boards. We offer adapters for MK4 hopper and ND-300 bill dispenser. On request we also supply you with fitting adapter cables. Our ND-300 bill dispenser adapter can be plugged into the CASH-Interface2 HOPPER connector. It offers the hopper’s motor run pin (OUT) and empty sensor (IN) so you can connect easily a ND-300 bill dispenser and use it in hopper mode. The adapter can also be used to have an extra INPUT and OUTPUT for the CASH-Interface2 if there is no hopper connected. For example we use this for the photo booth control to have external illuminated push buttons. Hint: The output can switch a maximum current of 50 mA, on more load you have to connect a relays between load and output. Bill validator and coin validator in BINARY mode. You have to adjust the channels of coin and bill validator accordingly. You can get the software and cable to reprogram the respective device from the manufacturer, or just choose the desired channel occupancy with your order. The software integration into your projects is done via default COM port commands or with the free CASH-Interface2 software (CI2.EXE). The source code of the CI2.EXE is available in the corresponding subdirectory. Another possibility to implement the CASH-Interface2 into own projects is to use the demo project. The CI2.EXE sends a WM_CopyData Message with every event in the format ID,DATE,TIME,CHANNEL,VALUE which can be received from your software. Additionally the program writes a logfile LOG.TXT in the same format, which can be evaluated externally from your software. To load CASH.EXE on system run just put a shortcut into the autostart folder. Simply activate the HIDE checkbox to run it invisible in the background. If the connection to the CASH-Interface has been established, means the Com port is open, all settings have been read on port open from the CASH-Interface2 board and are shown in the software. Now the values for coins (COIN VALIDATOR) and banknotes (BILL VALIDATOR) can be set to any value of your needs. Hint: In PARALLEL mode we only use coin 1-6 settings, this is shown in the software, too! Now just set the coin or bill value for the corresponding channel. Example: The coin validator has been set up to this, #1 - 10 Cent, #2 - 20 Cent, #3 - 50 Cent, #4 - 1 Euro, #5 - 2 Euro, so set for #1: 10, for #2: 20, for #3: 50, for #4: 100 and for #5: 200. Finally all settings must be sent to the board by pressing the "Write settings" button. To verify the new settings are really stored correctly onto the CASH-Interface2, just send the command CASH_READSETTINGS by the "Send command" button, the CASH-Interface2 sends then all settings to the PC again. If "Log all events" is active all data is shown in the log. Alternatively close the Com Port and open it again, with activated "Read settings on port open" the settings are read again from the CASH-Interface2. Commands to the CASH-Interface2 have to end with a "carriage return". In computing, the carriage return (CR) hexadezimal 0D or dezimal 13, is one of the control characters in ASCII code. The CASH-Interface2 detects a byte with the value #13 ($0D) as command end. All data from the CASH-Interface2 ends with a "carriage return" and "line feed" (CRLF = Enter). This way you can detect the end of the data. When you receive the bytes $0D$0A all data has been received and the data can be processed. The communication from and to the CASH-Interface2 can be tested with a terminal program. Example: "CASH_SENSOR 0" or "CASH_SENSOR 1"
Returns: "CASH_SENSOR=n". On Error "ERROR". Example: "CASH_TOTALBLOCKING 0" or "CASH_TOTALBLOCKING 1"
Returns: "CASH_TOTALBLOCKING=n". On Error "ERROR". Example: "CASH_BINARY 0" or "CASH_BINARY 1"
Returns: "CASH_BINARY=n". On Error "ERROR". Returns: "CASH_OUT1=n". On Error "ERROR". Returns: "CASH_OUT2=n". On Error "ERROR". Returns: "HOPPER_n=x". On Error "ERROR". via coin #5 line. To activate this the jumper JP1.1 must be set. sets the hopper pulse length in milli seconds. Default is 100. Returns: "HOPPER_PULSE=n". On Error "ERROR". sets the optocoupler 1. Pin7 is GND. If you do not use a hopper you can use this as an output. The optocoupler is able to switch 80mA current. Returns: "HOPPER1_ON". On Error "ERROR". resets the optocoupler 1. Pin7 is not GND. Returns: "HOPPER1_OFF". On Error "ERROR". sets the optocoupler 2. Pin7 is GND. Returns: "HOPPER2_ON". On Error "ERROR". resets the optocoupler 2. Pin7 is not GND. Returns: "HOPPER2_OFF". On Error "ERROR". sets the optocoupler 3. Pin7 is GND. Returns: "HOPPER3_ON". On Error "ERROR". resets the optocoupler 3. Pin7 is not GND. Returns: "HOPPER3_OFF". On Error "ERROR". Returns: "CASH_COIN_n=x". On Error "ERROR". Returns: "CASH_BILL_n=x". On Error "ERROR". Example: "CASH_WATCHDOG 0" or "CASH_WATCHDOG 1"
Returns: "CASH_WATCHDOG=n". On Error "ERROR". Reset the internal watchdog timer. Should be sent from the host application around every 50 seconds. Watchdog timeout is 60 seconds. The on board relays max. voltage is 200V, max. switching load is 15W. The transistor max. current is 0,8A. Connect the CASH-Interface via the 9pol. com cable to the serial port on your PC. It is possible to use a USB to serial converter, too. Connect the coin and bill validator via the flat ribbon cable to the CASH-Interface2. 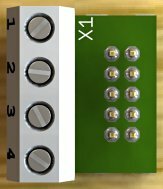 Connect the +5V and +12V power supply. If you use the PC power supply use the RED cable for +5V, the YELLOW cable for +12V and the BLACK cables for 0V. Ensure that the poles are connected correctly! By use of an external power supply the power supply should min. support 12 V/1.5 amps current for the bill validator. For a coin validator the power supply should min. 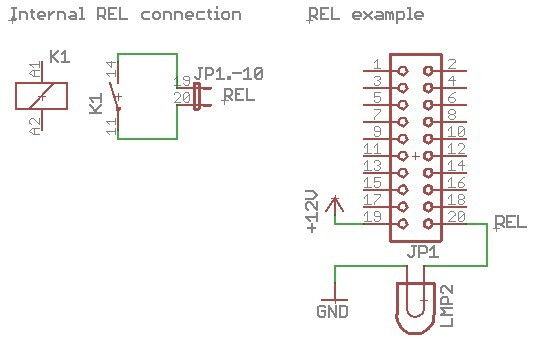 support 12 V/0.5 amps current. To supply both devices you need a power supply with at least 12V/2A. On the CASH-Interface2 the green LED indicates the power supply is ok.
To test the CASH-Interface2 please use the Delphi example program ci2.exe. The example program can be found in the folder /delphi/example/ci2.exe or a shortcut in the Windows startmenu, all programs, CI2, Example. Start the example program and set the right com port. Activate the "Open" checkbox. The connection to the CASH-Interface2 is open now and commands can be sent and data received. Select the command "CASH_READSETTINGS" and send it to the CASH-Interface2 with the "Send command" button. The CASH-Interface2 answers to this command with sending all stored settings. 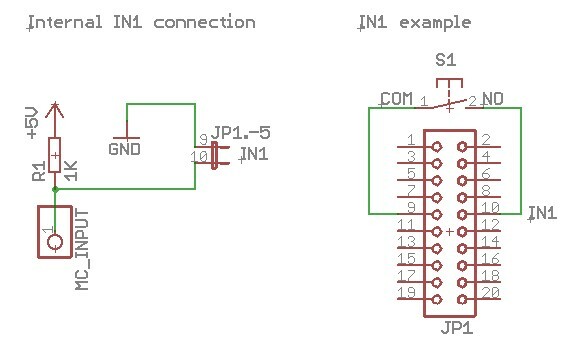 To avoid manipulation via EMP signals it is possible to connect a external sensor to IN1 input (CASH_SENSOR=1). Only if the sensor signals a bill or coin the IN=x command is sent. If the COM port is open, in the log there must appear the answer from the board with all settings. If not there is something wrong with the connection to the CASH-Interface2, or simply the wrong COM port setting. Check tight cable connections and the power supply is connected correctly. Using a USB to serial converter the correct COM port number can be found in the Windows device manager.